Photographed resting on twigs of Ambrosia eriocentra in a desert wash near Vulture Peak, s. of Wickenburg, Maricopa Co., Arizona. Oct. 6, 2002. Species id was suggested by Bruce Walsh. What appears to be a bit of dried leaf or bark is in reality a moth. The common name refers to the hind wings which are concealed in this view. 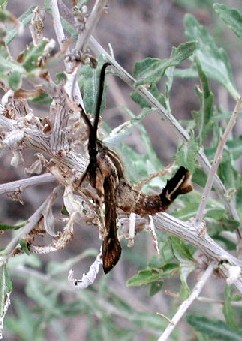 The caterpillars of most species bore through young stems of various plants and in this case Ambrosia eriocentra is the likely host plant. One common species, the Squash Vine Borer, sometimes makes squash cultivation difficult by boring through stems and killing them.